M.S.S. TRADEWIND is an ex-US Navy Landing Craft Swimmer Reconnaissance Vessel. 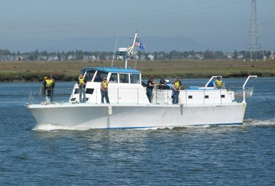 Seven LCSR's were built by Uniflite during the Vietnam War and designed for the Navy as a fast, well-armed patrol boat, seaworthy enough for offshore patrols but with a small enough draft to permit operations in coastal waters. The hull was designed to plane with the gas turbine engines that were originally installed. These boats were designed to drop off and retrieve Navy SEALS. These vessels never got beyond the testing stage. The hull is fiberglass, 50 feet long with a 13 foot beam. M.S.S. Tradewind took over the vessel in 1994, rebuilt and installed a pair of GM 671's acquired through the Sea Scouts, and has been operating it ever since! We have added a hydraulic steering system, water and holding tanks, redesigned the galley and both heads. Recently we added a 7.7kw Westerbeke generator and took on the task of completely rebuilding the crew's quarters! Whew! A lot of hard work has gone into this old gal!